The Deluxe Brushed High Back Stool Green is an elegant item that will look sublime in any domestic bar area. Bright and eye-catching, the Deluxe Brushed High Back Stool brings a modern vibe to many settings courtesy of its simplistic yet striking style. Clad in sumptuous green faux leather, the seat adds a fresh and vibrant look. This is padded with dense foam and has a high, supportive backrest for superb comfort after even long periods of use; the ergonomic profile cosseting your body. With a hand-brushed stainless steel framework, it is helped by the curved T-bar feature footrest beneath and the integrated hydraulic mechanism, which provides height variability and 360 degree spin. This gives easy access to any bar table or countertop, whilst the base beneath keeps you rigid and secure, thanks to the convex style and the protective rubber guard that is suitable for all surfaces. 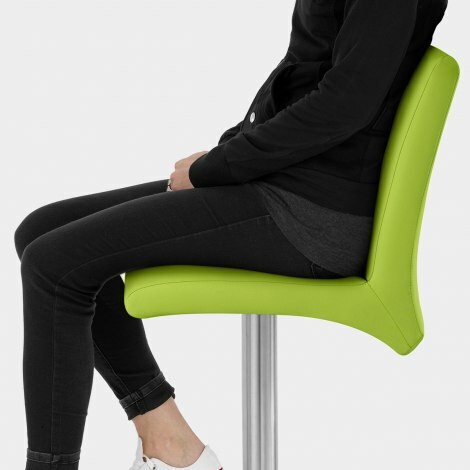 "Very stylish, comfortable stools - look great"
This is the second time I have used Atlantic for Bar Stools and they have been fab on both occasions. Great standard and extremely well priced...Next day delivery was great too. Exceptionally quick service. Very well packed and very simple assembly. Stools look good quality and good value. Good quality, Fast Delivery. Very happy with Atlantic all round. We bought a third. Swift next delivery - good quality, good colour, servicing us well.